She believes that Art is her meditative tool and every artwork is created with the synergy of mind and happiness replicating a plethora of celebrations on her Canvases. Art and culture are inherent in her paint tubes with India being her motherland. Her journey towards the artistic world sprung during her Master’s in Engineering at Cambridge University, UK.Being a self-taught artist in Acrylics, Impressionism works of Van Gogh, Claude Monet and living artists like Iris Scott & Justin Gaffrey have greatly influenced her recent works. The colourful imaginary world that she sees through her mind is portrayed through her palette knife & mixed media on canvas with great texture & 3D effects. She loves everything that is colourful & artistic which is amalgamated in her paintings in the form of bright colours & designs imbibed from the Indian culture. With a delicate mixture of colours & techniques, the themes varies from scenery to creature, from abstract to metaphorical, from cultural to standalone. Her current projects are titled ‘’Back to the Roots’’, a Series about an exploration of her country, India which has varied heritage and cultural backgrounds. The rituals, festivals, beliefs, indigenous breeds, sculptures, history & dances are the main emphasis on this series. The Prism Series created in the past year, have given a way to another Wildlife Series ‘’On the Edge’’ which highlights about the forest life of animals & their extinction because of the evolution of the mankind. 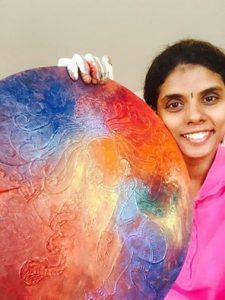 She creates each Artwork & Home Decors with rich colour tone palette which evokes positive vibrations in the minds of the viewer.